Austrian contralto singer; born at Theresienstadt, Bohemia, Aug. 31, 1853. At the age of seven she entered the Prague Conservatorium, where she studied for four years. Graduating with honors, she immediately received an engagement at the theater in Altenburg. Her principal rôles at this time were in Gluck's "Orpheus," Alcazene in "Il Trovatore," and Nancy in "Martha." In 1875 she went to Leipsic at the invitation of Friedrich Hasse, then manager of the Stadttheater there, and after her début was at once permanently engaged. Here she remained for twelve years, singing with extraordinary success under three successive managers, Friedrich Hasse, Angelo Neumann, and Max Staegemann. She frequently appeared also at concerts and in oratorio at Hamburg, Bremen, Leipsic, Brunswick, and other cities, her appearance at the musical festival of the Allgemeiner Deutscher Musikverein in 1886 being especially memorable in this connection. 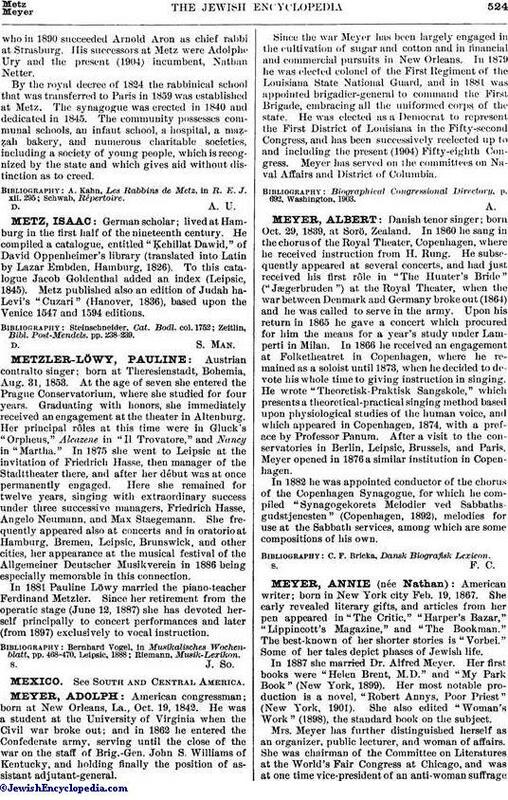 In 1881 Pauline Löwy married the piano-teacher Ferdinand Metzler. Since her retirement from the operatic stage (June 12, 1887) she has devoted herself principally to concert performances and later (from 1897) exclusively to vocal instruction.